This trumped up charge was the strange and malevolent ending of a period in Blake’s life that had at first promised to be financially successful; a time when he was apparently at his happiest. Blake had as a friend a man called John Flaxman, a well meaning, though mundanely inspired person, who felt sympathetic towards Blake and wanted to help him along the ladder of success. Flaxman recommended Blake as an artist-engraver to another friend of his, named William Hayley, a country gentleman who rather fancied himself as a poet. Hayley was interested and agreed to befriend Blake and push his fortunes up the ladder of fame. It was indeed a splendid opportunity for Blake and could have been a turning point in his career if he had so chosen. Thus in 1800, Blake and his wife, Catherine, were invited to move to the pretty seaside hamlet of Felpham, where Hayley lived, so that he would be the closer to his new patron. Blake now had a charming six-roomed cottage by the sea in exchange for the small residence in his beloved Lambeth which had been his for so many London years. At this period of time everything seemed set for a new and splendid life cycle. Blake loved his new home and felt tremendously free and for once surrounded by air, space and the glorious marine beauty of Nature. It was Paradise and he and Catherine revelled in it all “courting Neptune for an embrace”. At the time that Blake wrote this letter uneasiness even then made its insidious undermining at the roots of his soul, the Dark Stranger had already entered Blake’s life and waited invisible in the wings. We sense the underlying feeling of sacrifice of dreams, visions and all that upheld Blake’s inner soul, being traded in with a wrenching saturnine reluctance for the sober effort of now having to get down to life’s nitty gritty, like it or not. 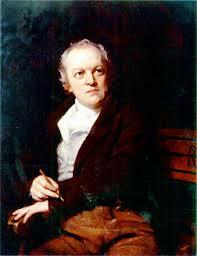 Blake, after all, is what Jung would call a puer type, an eternal child as are so many creative geniuses. Life’s boring realities are always at odds with the celestial vision. But we all need bread and a roof over our heads and here was Blake’s chance to make good and make some money, fame and fortune. Yet with all this promising beginning, this paradisical setting, that lurking God, whom Blake both adored and feared deeply and alternately named Satan, Urizen, Christ (as opposed to the mystical, loving figure of the man Jesus) crept in within a mere three years to sour it all, ending with the unpleasant incident of the trespassing soldier and a court case. Thus the soldier in his way took the role of the serpent whose sinuous undermining led to the eviction of Adam and Eve from their Paradise home, a theme that Blake was forever depicting in his poetry and art. Sometime in July of 1803 Blake’s apparently innocent and peaceful Felpham Paradise was invaded by a private from the troop of Royal Dragoons stationed nearby. The man had been invited in to help cut the lawn by the gardener who omitted mentioning this to Blake. He was deeply angry for he hated soldiers, war-mongers and other minions of the State. He had been an advocate of revolution, followed the works of Thomas Paine, Godwin and other outspoken people of the time, though like all these found the disturbing, grim reality nothing like the ideal. Plus Blake was paranoid about his privacy; a loner who felt immensely threatened and invaded by the outside world. He therefore asked the man to leave his garden. The soldier was impertinent in reply; Blake asked again, the man threatened most unpleasantly to knock his eyes out. Now Blake was known as a peaceable, good-natured man and at his later trial many attested to his kindliness and peacefulness. But there was a hot tempered side to him as well. Here intruded therefore his own inner warmonger, the invasive soldier within, into the apparent peaceful temenos of his Felpham cottage. Blake’s intense emotional reaction smacks of a Shadow issue. An incident which was nothing in itself suddenly became a regular drama. The incident took place some time between July and August 1803. Blake was already tired of William Hayley and his demands and planning to return to the more secluded atmosphere of London where one might lose oneself totally amidst the collective, while in Felpham he probably was far more of an eccentric object of interest and curiosity. Certainly it would make Blake feel invaded by some unpleasant transgressor, a Dionysian element as if Neptune, whom he had welcomed at first as his friendly deity when he and Catherine moved to the seaside, was now creeping in as an invader and also as a deceiver. For the soldier, fiercely ejected by Blake and marched back to his barracks took his own nasty revenge by lying about Blake and swearing that he had uttered words of sedition against the king and country, “damn the King, damn all his subject, damn his soldiers, they are all slaves, when Bonaparte comes, , it will be cut throat for cut throat and the weakest must go to the wall ; I will help him” and so forth. However, at the trial held at Chichester Jan.11th 1804 10.am, the soldier was proved to be a down and out ruffian and liar and Blake was aquitted amidst the cheers of his many friends and well-wishers. The whole incident was nonetheless a peculiar culmination to this time in his life when Blake could have chosen the easy path of conforming to what his patron Hayley needed and for once securing himself a less precarious mode of living which he sometimes seemed to yearn for. But did he really stand a chance? Flaxman, in introducing Blake to Hayley, had hinted that Blake would do best at teaching engraving and drawing, making “neat drawings of different kinds” and would be best to be discouraged from “any dependence on painting large pictures, for which he is not qualified either by habit or study”. This led to Hayley’s well-meant rejection of Blake’s grander and individualistic ideas from the start. “Natural Friends are Spiritual Enemies”. Flaxman and Hayley were true friends, one might say, but Blake would later state the fact that “natural friends are spiritual enemies”. What did he mean by this, we wonder? And why were friendships and general dealings with the collective always so problematic for him? These “friends” meant well from a worldly point of view, but Blake was not a worldly person. If he had followed this path, sacrificed his visions and stuck to ‘neat drawings’ we would have yet another mediocre eighteenth artist who would have faded into obscurity with many others. 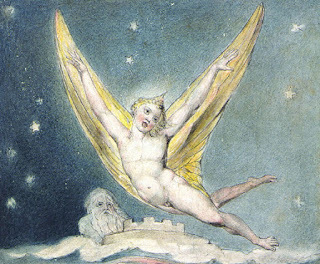 Blake constantly found himself passed over by those of lesser talents, illustrating books of inferior poets to himself. By the time the incident took place with the soldier, he had already come to the end of his tether and this incident was probably an expression of his frustration and anger that Paradise had after all turned so sour. He felt that it was in his native place, in Soho, London, that he was more at ease, more in tune with his visions. And so he returned to live at South Molton St., a return to his beginnings so to speak for he was born near there. Here he lived for 17 years, scarcely going out; here he wrote his great work “Jerusalem; the Emanation of the Giant Albion”. So we cannot help but feel the unpleasant soldier was a better friend than Blake’s supposed benefactors. And yet while at Felpham, Blake had written another of his great epic poems, “Milton” and drawn some of his finest works, so his time there was not at all bereft of angelic vision for all the difficulties encountered. Angels and Devils, visions of Heaven and Hell. On England’s green and pleasant Land. 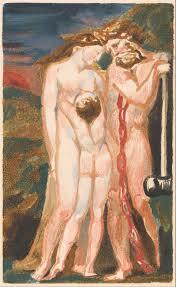 For a Sagittarian, with a Sun-Jupiter conjunction, Blake was strangely insular by nature. But he has Cancer Rising plus the Moon in that sign in the 12th house. Emotionally and by habit, he preferred the introverted, inward poetic gaze to the external, limited world of form. Form came through his fiery poetry and pictures. Though he adored Nature he never did landscape drawing for he saw everything with the mythic, imaginative eye that found meaning in all things. Nature was suffused with the Divine and played upon his deepest emotions and feeling imbues all his works. If we take a look again at this important period round 1800-3 we sense an inner reluctance to give up his dramatic, noble, fiery visions and spiritual values for cramping, dulling, rational, materialistic ones. His visions are as meaningful now as they were then. 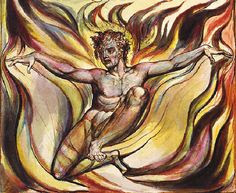 In fact, Blake was a very modern man and many of his pictures border on surrealism. It is no wonder he appeals to modern man who is equally tormented by the same strange Faustian mixture of atheism, mysticism, cynicism and who tries to make sense of a politically correct ideal world were all is acceptable and united in an all-embracing fusion yet oddly disintegrated, separate, chaotic, boundary-less and full of incessant anxieties and horrors. Blake did at least acknowledge that he had both an Angel and a Devil in him which is more than most of us do and his major works were centred round Milton who wrote Paradise Lost and Regained and Dante’s visions of Heaven and Hell, which Blake magnificently illustrated. Basically Blake felt his view of God was all angelic and he criticised Dante ‘who sees Devils where I see None’ but this was palpably not the case. True his tendency was to be positive and optimistic and joyful and see the good in everyone but this naturally had its judgmental, rejecting opposite lurking in the Shadow. 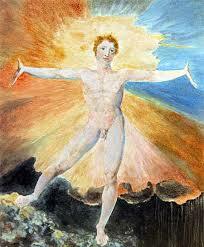 In fact, Blake had a peculiar, confused and tormented vision of God yet there is also the opposing vision of joyfulness, simplicity and colour, song, beauty which he called Orc, his “spiritual Sun”...as opposed to the natural Sun which he called Satan, the Greek Apollo. Here he seems to speak of his own inner intuition of the Self, his inner core identity. He tried over and over again to embody this fierce, highly personal vision of God in his work and to understand Him through it. He painted, wrote of it all in his verses and songs and gloriously illustrated books with intense passion (Mercury in Scorpio square Mars-Neptune in Leo); the eternal struggle of the visionary against the cramping, stifling bonds of realism. It also indicates the problems he always felt over well meaning friends who, while feeling intuitively that he was a talented person and genuinely trying to help him, seemed unable to truly understand his work or appreciate his real genius except towards the end of his life. Basically Blake was a true alchemist who had to follow the solitary path of his own Great Work, magician, distiller, dissolver, working unceasingly on his vision till the end of his life. He needed to be alone and retreat from the world for he was engaged on a supreme task. His efforts were the superhuman efforts towards unity and cohesion of the disparate and confused pieces of oneself that float about in the psyche like the pieces of Osiris flung here and there by Dark Seth. His beloved wife Catherine who worked patiently beside him, sublimating her own personality to help him, was his Isis, his soror mystica, the spiritual sister who labours with the alchemist on his task. If anyone was Blake’s true friend it was this woman who gave up her life for him, grateful, loving, worshipping God through him – his companion till the end. It is first mentioned to Hayley in the letter dated Aug 16th 1803 but there is no mention of it to Butts in a letter dated July 6th 1803.
see P.171-2 of Gilchrist’s book. for date of trial, charge against Blake.